The Gooding & Company auction earlier this month of two black and red Mercedes 300SL Gullwing coupes realised US $1,897,500 including buyer’s fees for the unrestored car. Click Here for our earlier report of the two Gullwings up for auction. The key selling point of the unrestored 1956 300SL Gullwing was its originality. Although some of its black paint had been touched up over the years, the bulk of the finish was said to be original, and the red leather interior was the same one that the car left the factory with nearly six decades ago. Even the torn and sagging headliner was original to the car, leaving the new owner with difficult choice: refurbish the car as needed for preservation, or restore it to a factory-fresh state. Gooding originally estimated the unrestored Gullwing’s selling price at between US $1.1 million and US $1.4 million. 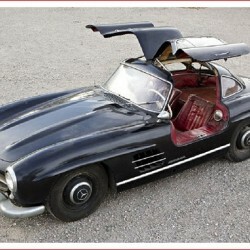 The second Gullwing, which had been fully restored, sold for US $1,402,500. This car had originally left the factory painted red with a green tartan interior, but a subsequent restoration changed the livery to the less common black with red leather. Isn’t it interesting that the unrestored Mercedes Gullwing sold for considerably more than the restored example? I’d be very interested in any comments you might have about this situation – would you prefer to buy a restored or an unrestored car if you had the choice? Click Here to visit the Gooding & Company website for more details of their January auction results.